The episode starts with Harashima's car driving over the bridge towards the poorer part of Tokyo. He is listening to the radio with his doing a report on his company and his work. They're discussing how the poorer people are being thrown out of work because of Harashima's building plans, particularly in Taiwan. However, they take time out to mention him too commenting that "Harashima should become more human, before he tries running a business". The driver switches it off and glances back at Harashima nervously. Harashima sighs and looks out the window, not really looking offended by the remark on the radio. The car drives off into the narrow streets of downtown Tokyo, all of the lower class people drinking to get out of the way of the slow moving car. "Yes, sir!" the driver replies, he stops the car and gets out to open the door for Harashima. He steps out of the car with head held in a rather dominant way. He tells the driver to return to the company. He then makes his way down the streets, past some young children and towards a very modest looking pharmacy. He looks rather nervous as he goes in, but head held strong still, goes in. A mother chases after her disruptive child and drags him back. Harashima is sitting in the surgery reading the newspaper. There is a man sitting next to him, clearly troubled about his test results. "It must be cancer" he murmurs, "It has to be cancer" he looks at Harashima who has glanced up by his comment, "It hurts!" The man's eyes meet Harashima's and Harashima looks away hoping the man didn't notice. The man does, and moves up close to Harashima with a solemn look on his face, "You think it is cancer then?" As Harashima moves himself away, the man looks around, clearly offended. He taps Harashima on the shoulder, "You're cold!" "Shouldn't we sick men console one another in our time of need?" the man asks. Harashima nods and quickly replies: "You'll be fine". The man then grabs one of Harashima’s hands and places it on his stomach hysterically, "It hurts around here, right here, there... Do you think this is cancer?" Harashima pulls his hand away and shakes it, as if he had something nasty on it, "I wouldn't know" he says uncaringly looking back at his newspaper. Just then the nurse calls for the man to go in, "Shimodaira Konosuke, please go to examination room #1". Konosuke nods in reply and goes off towards the room, he turns back to Harashima. "I-I'll be going now!" "Yeah..." Harashima says looking up and nodding, "Hang in there". "The tumour has become much worse and the cancer has started to spread throughout your body. It's beyond treatment". Harashima, though clearly shocked seems to take this very calmly, "How do I have to live?" the doctor tells him about half a year, though if he were to enter treatment, he'd live a bit longer. Harashima refuses to enter treatment and says he plans to keep this secret until the very end. Back in the reception, Konosuke is out and much more cheerful. He counts his money and realises he's 30 yen short. He asks the nurse for a discount, as he found that he didn't have cancer but food poisoning. The nurse refuses, and Konosuke once against comments on coldness. He spots Harashima leaving; he catches him up and asks if he could borrow 30 yen. Harashima reaches into his pocket and hands him 100 yen. As Konosuke pays and gets the change, he finds that Harashima has left. Harashima is sitting outside near the playground thinking about what the doctor had told him and holding his watch. Half a year. Harashima looks up to find three teenage boys with their hands out, demanding money for sitting on their bench. Harashima looks at it and then at the boys, making it clear he has no intention of moving. The boys pick at his suit and force him to stand up and push him against a fence. Just then, Konosuke comes up behind them hitting them around the head. "Hey, you're Kenji's little brother? Shouldn't you be studying for that test tomorrow? Huh?" Konosuke says, "Go on! Go home and study you fools!" The boys rush off home, leaving Konosuke and Harashima. Konosuke turns and smiles at him explaining that he shouldn't take it personally, and that Kenji's brother is really a good kid. They're just having money problems. He then gives Harashima his change. "I'll get the 30 yen back to you straight away!" Harashima thanks him and tries to walk away but Konosuke stops him, "Hey, I said I'd pay it back and I mean it! Come on, let’s get a drink and I'll give you the money there!" No matter how hard Harashima protests, Konosuke won't listen and they go off to the restaurant he always goes to. When there, Konosuke orders them some food and a drink to toast to their good health and speedy recovery. Konosuke is in high spirits, exclaiming his happiness. Then, just as he does he remembers to get the 30-yen for Harashima. Once he's paid, Konosuke's friends come in: Nakahata (a chubby and small-eyed man, Konosuke's best friend), "Sensei" (a clever man who always carries his "Book of Japanese Law" as he hopes to pass law school) and Kenji (a young man about Kaori's age). They all creep towards Konosuke, asking if a man with cancer should be hanging out in a place like this. Harashima sits in a silent grump and Konosuke explains he only had food poisoning. While all of them grunt on, "Sensei" takes out his law books and glasses. Harashima drinks down his sake and tries to leave but Nakahata grabs him and hugs him asking Konosuke who he was. "Glad you asked! He's my hospital buddy!" Konosuke says proudly, tapping Harashima on the shoulder, "He's celebrating with me! He's letting all of us join him!" 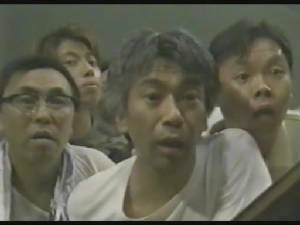 Konosuke, Nakahata, "sensei", and Kenji all start cheering and drinking. Harashima once against remembers what the doctor said. Half a year. He grabs another glass of sake and drinks it down. He looks about as the others are jumping about like morons. Harashima then gulps down another glass of sake. He stops, gasps and then tumbles straight off his chair. Harashima wakes up the next day. After drinking too much at the pub with him, Harashima finds himself in Konosuke's flat the next morning. That's bad enough... without Nakahata (also having drunk too much last night) wakes him up with yet another one of his hugs. Harashima, not wide awake, scurries away from Nakahata and up far against the far wall. He turns to look to his side. There is Konosuke's son, Shinpai. Harashima stands up to see Konosuke making a traditional Japanese breakfast. "You're finally up?" "What happened to me?" Harashima asks nervously, Konosuke doesn't listen and hits Nakahata to wake up. He then goes back to breakfast. Harashima walks over to Konosuke. "What happened to me last night?" Konosuke ignores him again and takes a towel of from around his head and hands it to Harashima, who sees that it has a large hole in it. Nakahata tells Harashima to come with him to the bathrooms. It's a line of sinks and showers. Nakahata takes the towel. "What happened to me last night?" Harashima asks again. "You fainted and we carried you here. I stayed over too!" Over breakfast, Harashima tries to pay for the tab and gives Konosuke the money, which he gives to Shinpai for his lunch money. Just before Harashima leaves, he over hears Nakahata asking Konosuke to be the guarantor, Konosuke agrees. Harashima then leaves as Konosuke tells him to drop by sometime. "HARASHIMA GROUP! WE OPPOSE YOUR APARTMENT CONSTRUCTION!" He shakes his head again and makes on his way, not before he hears a bike bell ring. "Excuse me, sir!" a young woman calls. Harashima casual steps out of her bikes path as she rides by him. He walks on, paying her no attention. The pretty girl stops and turns her head, "I'm so sorry!" she says, but Harashima ignores her. The girl sighs and rides on her way. "Good morning, this is Harashima speaking. Have you read the newspapers yet? Yes. Thank you with my best regards"
He puts the phone down and his workers look at him questionably, "Chairman?" "Public opinions are normally made up by the media" Harashima explains, "So we'll just have the media write something in our favour". He hands his secretary the check and tells her to deposit it into Malina Press' account. He then tells his workers that they aren't doing it as a favour for him; they're doing it for money. He then calls a meeting to resume all the ongoing projects. Meanwhile back at the downtown... Konosuke is finally on his way to work with Nakahata. Also on her way from work is Misao Fujimura, Konosuke's girlfriend. She works at the factory with Konosuke, Nakahata, "sensei" and Kenji. Misao is wheeling her bike and making it clear to Konosuke she is not happy with either of them. "Why are you in a bad mood today?" Konosuke asks her, jumping on her bike as she wheel it. "This doesn't concern me..." Nakahata comments between the loving couple's argument. "Loss of sleep isn't good for your looks,” she says, switching her argument from Konosuke to Nakahata, taking an occasional time-out to slap Konosuke's hands off her bike. "No advances for you!" "I wish you'd help me out... as executive secretary,” Nakahata pleads. "You should think before you speak!" Misao tells him, "How can you ask for an advance from a company going under and late in paying payroll. Idiot!" Konosuke gets off her bike, seeing that she's very upset and in a bad mood for more of a reason then because of Konosuke's drinking and fainted pal staying over the other night. "Is the factory in a bad situation?" "We have hardly any work to do,” she tells him. "That's true!" Konosuke says as he and Nakahata breaks into laughter. Misao then gestures to the big sign hanging up over their apartment building; explain that it was Harashima who was applying pressure so the company won't get any orders. She then orders then to come to work and they set on their way together. Back at the Harashima Enterprise Building... Harashima is in a meeting with his directors, bidder people and other workers. Yoshimura, as favourite of Harashima's is explaining the situation. He has completed the A purchases. Harashima explains he's impressed with his work and tells Yoshimura that he wants him to take charge of District B purchases (Konosuke and Kaori and co. homes). He explains that they want to build a new town and a new link to their shopping centre empire. He then announces that he wants all purchases completed in half a year. Everyone is shocked. Very little time. But Harashima insists and tells Yoshimura he's counting on him. After the meeting, he and his secretary are talking about the meeting. She comments that she thinks it'll be a success. That Yoshimura can be trusted. Meanwhile at the building factory, Konosuke, Misao, Nakahata, "Sensei" and Kenji are all talking about Harashima. Misao points towards the building opposite them and explains that their boss is trying to sell their company to Harashima. Konosuke laughs saying that Harashima must be an idiot to want to buy an idle factory like theirs. "You're the idiot" Misao tells him, "Once he buys it, he's going to close it down and then tear it down. Then he'll build a shopping centre here!" "Not too bright, are you?" "Think I could get an advance?" 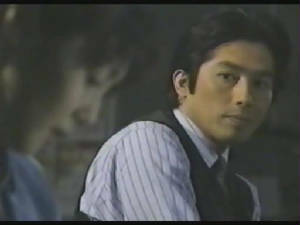 Nakahata asks Misao, worrying about money again. To which Misao snaps and says that he'd be an idiot to think he could. Cut back to Harashima who is over looking his other chain stores and their grossing and profits. Sales have been going down. His secretary comes in with more sales reports for the department stores. He then asks her a very awkward question. If something were to happen to him, what would happen? She explains that the company would split or fall apart, because there is no one to take his place. Harashima has no children to pass it on to. He goes to one of his chain stores that have poor sales records. As he walks in, everyone in the place starts to panic as they see him walk in. As Harashima walks in, a worker rushes off to tell the boss. He is talking to Kaori, the same pretty girl who almost ran Harashima down with her bike. "What's with this?" she asks herself, "I thought it was perfect!" Harashima is talking in the empty meeting room with head of the department store. Harashima straight away explains that the store is lacking in funds. The man explains it links back to the radio show at the start, the bubble economy burst, the merchandise just aren't moving. Harashima explains that the main store means a lot to him, this is because it was the first business his father created and he had succeeded the store from his father. The man is a proud believer in Ryuzo Harashima, (Harashima's father). Harashima says they should put up the prices of the store with in half a year. "Shuichiro... listen carefully. Love is merely a momentary illusion, are all in the mind. Don't let love confuse you... and take the wrong path. Trust no one but yourself!" Hence, this is the reason Harashima has been left cold, ruthless and selfish. By the time he comes to, it's nighttime and everyone's gone home... Everyone that is except Kaori, a young innocent woman who works at designing and making displays for the store. After a deliveryman with a potted tree mistakes Harashima for Kaori (thinking he was the worker), Kaori herself mistakes Harashima for the deliveryman. After ordering him to help her carry the tree into place, she stops him from leaving after seeing that his suit had been dirtied by the soil. "You can't wear a dirtied suit on your date, can you?" Kaori replies, not really paying attention to meaning less way Harashima speaks. "Haven't you got a date?" Kaori asks as she cleans the suit. Harashima smiles a little (yes smiles) and embarrassed at her saying it tells her he hasn't got a date. Kaori stops for a moment and giggles a little. "Don't fib to me! Why would you be dressed up so handsome if you didn't have a date?" Harashima still stilling from his embarrassment and flattery, isn't sure what to say and do with him. "Have a seat" Kaori offers him. He does so and looks at her. For a strange moment, Harashima finds himself staring at her. She is working on getting the soil out of his suit. It seems that for the first time in his life, Harashima is drawn is drawn and attracted to someone for anything other then money or business. He shifts a little but still can't look away. She doesn't notice him looking at her at first, but as she looks up to look at him, Harashima's eyes quickly look to the side at the display Kaori is putting together. Kaori turns back to his suit. Harashima then looks back at Kaori, "Are you doing all of this by yourself?" Kaori says yes, explaining that she has to finish the first part of it by tomorrow morning and has to work all night. She then whispers, ironically worried that the owner himself might hear, that the store is very tight. Normally her designs took three people to put together, but tonight, it's a one-woman show. Harashima looks about at how much she's had to do and how much she's done and says it's far too much for one person. Kaori is thrilled that he understands her... Ironically she mentions that the owner doesn't understand that. "I know so! All he cares more about raising the prices... That's why he's losing all his young customers cause they can't afford to come here!" Kaori comments. "It's important to increase sales,” Harashima explains, but Kaori won't hear anything of it, asking why he sides with the owner. He smiles at her and says, "No, I'm not..."
Kaori nods and says, "You know, if I ever met the owner of this store, I'd tell him straight in his face that this store will eventually this fold!" Harashima smiles and laughs at the sweetness of her announcement and once again at the irony of her words. Kaori takes this aback, "What's so funny? I'm deadly serious! I really mean it!" Harashima is still smiling and nodding "No, I believe you! I do. The owner would be shocked to hear that". Harashima looks around and then back at her, "You seem to really dislike the owner, yet at the same time you don't want this store to fold?" Kaori shrugs and goes on cleaning the suit, "Is that wrong?" "No, of course not. I just wondered why,” he explains. Still smiling, he waits for her answer. Kaori goes to explain why, but she finds herself stopping and all she does is whisper... "I wonder" ... Harashima is suddenly intrigued by her comment. He's clearly quite smitten with her and wonders why on Earth she'd want to save the store. She smiles at him and hands his suit back to him. "Good luck on your date!" she tells him, Harashima this time doesn't argue with her and just says thank you. She then gets back to work and says goodbye. Harashima starts to walk off but looks back to view her working, she has no idea he's watching this time, but he just regards her for a few seconds smiling before going on his way. Once Harashima gets home, he finds the TV is on and there is Mayako, his fiancée. Mayako is the daughter of a politician, which is the real reason why he wants to marry her... To improve his business. He puts on a smile, though he isn't particularly pleased to see her and says, "You're here". Mayako nods explaining that she left herself in. "You should have called first" he tells her, playing more attention to what she's watching then her. "If I don't see you now and again, father with scold me" she explains. Harashima nods and goes to his desk to do some work. Mayako turns to look at him to find him working, and sighs. "I'm going home now". Harashima tells her she can stay longer if she wants, to which Mayako replies that normally a man would ask their fiancée to stay over. Harashima, not to keen on that idea just nods, Mayako approaches him. "If we don't set a wedding date soon... Father will get mad at us. I don't want to upset my dad,” she explains. She then quickly grabs her bag upon seeing Harashima's un-caring look on his face. Harashima offers to walk her home, but Mayako shakes her head puts on a smile and leaves. Harashima sighs and sits down on the sofa, thinking back on the day he's had. 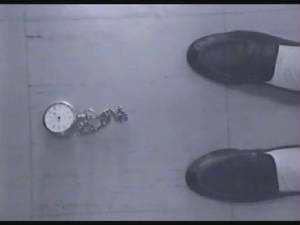 Episode 1: Pilot (The Watch) Outline © Sophie Withall, 2005. Adapted from "Kon'na koi no hanashi" AKA "A Story of Love".